Sounds like it. Better nip down to Lidl and get him some of those cat treats he likes. OH NO!!! It was only a few kibbles in greaseproof - but I was really looking forward to it. Has P.B eaten Horace’s packed lunch again? With “L”s & “T”s,horseshoes, wedges, or any other non rectangular shape of cushion, it’s safest to send us one of each size of cover for refilling or copying, or a paper template. Read on for how to make a template. Please include details of which filling and/or fabric would like, and your contact details - particularly your email address and phone no! Before sending the covers, you can get a rough price from our calculators by entering the length at the longest point, and the width at the widest point, and the thickness. 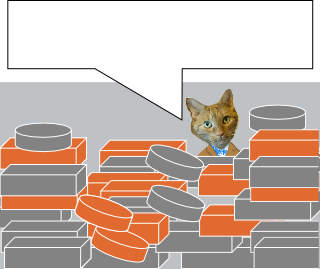 ( See photos with arrows - above) Some back cushions have two pads inside one case - treat each portion as a separate cushion, and the price you get will be the absolute maximum, our actual quote should be less! 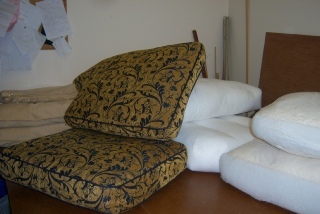 If you’re replacing a worn out cushion- probably no need to read further! Rectangular cushions are easy to measure, & new ones can be ordered on line. If the corners of your cushion are to be curved, measure a little in from the edge so that you are measuring between straight seams. See illustration below. If the curve is pronounced, more than 2-3 cm radius, it’s safer to treat it as a non-rectangular cushion. To gauge the thickness of your cushion, measure from seam to seam of the border of the cushion cover - not including any piping - see short arrow on photo below. This should tell us the original thickness even if the filling has collapsed . IMPORTANT. Cushions don’t have to be precise to engineering standards, accurate to 1 cm is OK. Measuring BENCHES, WINDOW SEATS etc. Normally fairly straightforward to measure, but watch out for non square angles, especially in older houses. Check the angles with a piece of A4 paper, if you haven’t got a setsquare to hand. Trapezoidal window seats are common, but beware - they may not be symmetrical! We’re happy to work from a template, you can use any sort of paper, we’ve worked from many a successful template decorated with multiple Father Christmases. This video might be useful, it shows a template being made from a chair, but the principles can be adapted to any area. There’s no set thickness for benches, but 5 - 7 cm bench foam is popular for smaller benches, particularly if they are to go with a table, where you need space for people’s knees. 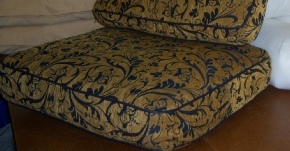 Hard seating which is to be used more like a sofa is better between 10 & 15 cm in something softer and more luxurious. Mattress soft is a good budget option, Supafeather Flat is a favourite for a luxury bench cushion. Hope all this has been helpful! Measure in centimetres, not inches or mm. Please, don’t add anything “for luck”, especially on the thickness of the cushion, and especially with Supafeather, Supafibre,Fibre and Wrinklebuster refilling orders. We automatically add extra, particularly on the thickness, so you could end up with a massively oversized, and overpriced, cushion. 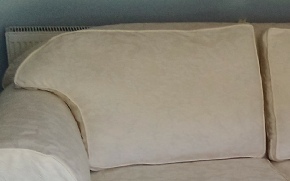 When measuring an existing cushion for REPLACING. Measure your cushion’s outer cover NOT THE PAD INSIDE, which may be OVERSIZED, STRETCHED, SQUASHED or DISTORTED in some other way! It’s easiest to lay the cushion on a flat surface to measure it. Measure the width and length near the seams, not over the middle, which is the part most likely to be stretched and distorted. If you’re designing a new cushion, please read on. These measurements won’t tell us enough!! HOW TO MEASURE. There’s quite a lot of this, and not all of it will apply to what you want us to make for you, so please be patient and skip the irrelevant bits. Trials of a Small Businesscat.